There is always a sad feeling about seeing a closed distillery. my conversation with Alan Winchester, recently promoted production manager for all the Chivas distilleries after having managed Aberlour distillery for a number of years) prior to my visit of Glen Keith last may. What I gathered on Glen Keith was a revelation for me, Glen Keith was not just a distillery. It was Chivas living laboratory where they experimented all sorts of productions and processing systems. A sort of apprentice sorcerer’s secret research laboratory (well, I admit my writer’s imagination tends to bring a dramatic ingredient which might not be in the recipe !). When Chivas opened Glen Keith distillery in 1959 (with an official opening in 1960), they made it clear the entire production was aimed for blending purposes. The whisky was to be an important ingredient for Chivas Regal (but also Passport and 100 pipers). The distillery stands in the shadow of Strathisla, heart of Chivas and one of the most visited in Speyside. I have never met anyone who resisted the charm of this dollhouse distillery. Its whisky makes up the heart of Chivas with, for resulting effect, a total underating of Strathisla single malt. Located on the bank of the small river Isla, Glen Keith stands at the back of Strathisla. It took its name from the city (the name Keith coming from the gaelic translation of wood, according to Misako Udo). It was named « Glen Keith-Glenlivet » until 1978, when, as for many distilleries of the region, the « Glenlivet » was dropped. The previous function of the buildings explain the location by the river. They sheltered a meal-mill which was converted into a distillery between 1957 (date of purchase of the Angus Milling Company) and 1960. In fact, most of the buildings had been demolished. But all the front part had been kept with its stone walls and a superb paved yard. The back part (mash house and malt area) was build in concrete. The owners (Seagram at that time) also built large racked warehouses by the side as a storage area for Glen Keith but also for the other malts of the group. Today, it is also the filling-store for Strathisla, the new make is piped in. Glen Keith was the first « new » malt distillery opened in Scotland since the boom of victorian times in the 1890s. Glen Keith started with a set of three stills as it was to be triple-distilled (fulfilling the needs of the blending industry for a light and fruity spirit). It was also the first distillery to experiment automation for the mashing then the distilling in the 1980s. In fact, Glen Keith was the experimental ground of Seagram company. The idea being to test on a small scale what would be developped on a bigger one. Alan Winchester compares Glen Keith installations to those of Bushmills. « There was a wee pot-still we used to call the Irish still », he says. 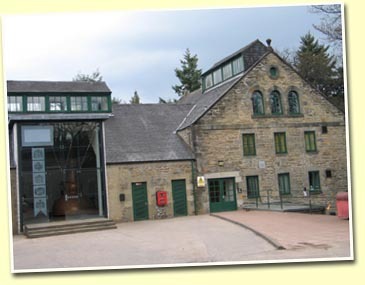 Glen Keith turned to complete double distillation in the 1980s. 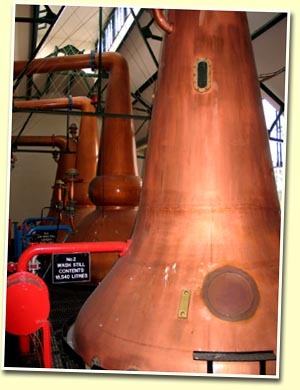 Two new stills were added in 1970 and for ten years, triple and double distillation were alterned. The Spirit Stills have bowl necks whereas the Wash Stills are onion-shaped. There was also a column installed on N°3 still. It has been removed in the 1980s. Glen Keith stills were the first gas-fired stills to be installed in Scotland in 1971. Three years later, they were converted to steam coils. As among the many experiments which were conducted, wheat mashes were made at Strathisla and Glen Keith. There are somewhere in the warehouses casks of « mashed wheated Strathisla » (which could not be called so of course) and which probably go into blending. The stills have a very long lyne arm which makes quite a right angle. Glen Keith used to practise its own malting in saladin boxes. The maltings also provided Strathisla with malt (the malt was blown to the distillery through pipes). The Saladin boxes were closed in 1976 (but they could still be used). The mash house was originally located where the laboratories still are. Then it was transferred upstairs, near the Saladin boxes and the kiln. A peated single malt was produced at Glen Keith for a number of years. It as been bottled by ID (Gordon and MacPhail) under the name Glenisla. But the peatiness came from the water and not from the malted barley. The peat came from Stornoway on Lewis island (outer hebrides). Alan Winchester cannot explain why they chose peat from so far away. All these experiments were led by the Americans in Seagram headquarters. The peat was burnt and the peatsmoke passed through the water (making a sort of tary solution) which was then used in the making process. Signatory Vintage has also bottled a peated version of Glen Keith (this time made with peated malted barley). Another very interesting aspect of Glen Keith experiments was all what they did about yeast. They produced their own strains, from the wort first, then from the pot-ale. That yeast was used by the distilleries of the group, especially Strathisla and Glen Grant. Nothing has ever been said about those experiments which were conducted by a foremost authority on yeast, DrWatson (who is still with Chivas company). Now as most distilleries, Chivas use commercial strains from Quest and Maury. But the strains have been pasteurized and are kept in the yeast library. It would be interesting to learn more about the subject. Alan says that the experiments were conducted to produce specific flavours. He agrees to say that yeast is very important in the making of the aromatic profile (I have always a deny on that question each time I have raised it with distillers and I regret not to have the scientific understanding of the subject. I only apprehend it from the aromatic aspect). Glen Keith was mothballed in 1999 by Seagram. Since it was bought by Pernod Ricard (2001), nothing has changed. The inside buildings suffer from desertion. It is such a pity to see that beautiful stillhouse deserted (the stills are there and could be operational easily). The mash tun and washbacks are also not too badly maintained. Pigeons seem to have adopted the place ! The outside building are really superb. I could easily imagine a conversion to artist lofts or a cooking school (sorry, fantasies here !!!). And what about all these experiments ? The laboratories still exist. There are casks containing these experiments. There sems to be a secret about all these (as if they were intentionally hidden). Was a « frankenstein whisky » produced here ? The visit of the place conveys that sense of mystery and secret… or is it my brewing imagination which could see the ghost of a malt Dr Jekyll ??? Any chanced of seing Glen keith reopened ? Very unlikely as allt-a-Bhainne was chosen for re-opening as it is a distillery which can easily be converted to a single man operation. Thank you to Ann Miller who took me round and to Alain Winchester (our « well of science ») who is certainly the most documented source on Speyside distllery. Alan started his career as an apprentice brewer at Glen Keith.